The Al Noor Mosque (Arabic: مسجد النور‎‎, Masjid al-Noor) is a Sunni mosque in the Christchurch suburb of Riccarton in New Zealand. The building is managed by the Muslim Association of Canterbury (MAC). In 2014–2015 the local press reported a controversy about whether a congregation member had been radicalised at the mosque. As of 2015[update] the mosque had 550 members. It was the primary target of the 2019 Christchurch mosque shootings. The Al Noor Mosque was built in 1984–1985 by the Muslim Association of Canterbury, which had been founded in 1977. 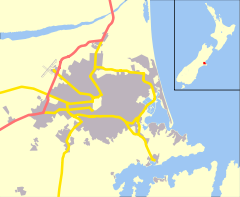 The Saudi Arabian government donated NZ$460,000 towards its construction. In 2003, the Christchurch Muslim community organised a "National Māori Muslim Day" at the mosque. In the same year, controversy arose inside the local Muslim community around the management of the mosque; the arrival of new members of Arab and Somali origin sparked tension with the earlier members of South Asian origin, who have a different culture and more moderate interpretation of Islam. In 2014 the New Zealand and Australian press reported an allegation that in 2011 an Australian convert, Christopher Havard, had been introduced to radical Islam at the mosque before going to Yemen to join al-Qaeda. The allegation was made by Havard's mother and stepfather. No further substantiation was given in those press reports. The mosque’s imam Hisham el-Zeiny denied the claims and said he had not heard anyone expressing radical views at the mosque. The president of the Federation of Islamic Associations of New Zealand, Anwar Ghani, said that mosque officials had told a Salafi follower not to promote his views there. El-Zeiny stated to ABC News that many Muslims were angry about US drone strikes in Yemen and that the mosque's leadership was "spending most of [its] time trying to lessen the effect." University of Otago professor Richard Jackson said it was "far-fetched" to think that Havard had learned about radical Islam in Christchurch. He added that such allegations would "fuel Islamophobia" in New Zealand. Victoria University professor Paul Morris said such allegations ought to get "raised and addressed". By 2015 the mosque had grown to 550 congregation members. On 15 March 2019, the site, along with Linwood Islamic Centre, was a target of the Christchurch mosque shootings. Forty-two worshippers were shot and killed inside the mosque. ^ "Media Must Play a Positive Role in Bringing Communities Together: Imam Gamal of Masjid Al Noor, Christchurch". Migrant Times. Christchurch, NZ. 4 September 2016. Archived from the original on 18 March 2019. This mosque – Masjid Al Noor – is managed by MAC. ^ a b Kolig, Erich (2009). New Zealand's Muslims and Multiculturalism. Brill. p. 33. ISBN 978-90-474-4070-3. The Canterbury Muslim Association (MAC) was established in Christchurch in 1977 … and was able to build a mosque … in 1985. In recent years, for a while, it was seriously disrupted by internal wranging over the management of the mosque and centre. ^ a b c d Schwartz, Dominique (4 June 2014). "Australian Killed in Yemen Drone Strike Not Radicalised in New Zealand, Says Muslim Preacher". ABC News (Australian Broadcasting Corporation). Sydney. A Muslim preacher in New Zealand has denied suggestions an Australian man killed in Yemen was radicalised at a Christchurch mosque.… Havard’s mother Bronwyn Dowrick and step-father Neill Dowrick told 7.30 their troubled son … had encountered radical Islam after moving to New Zealand. ^ a b Wall, Tony; Ensor, Blair; Vance, Andrea (27 July 2014). "A Kiwi Lad's Death by Drone". Sunday Star-Times. Auckland. Archived from the original on 27 July 2014. [Daryl] Jones was killed alongside Australian Christopher Havard, whose parents said he was introduced to radical Islam at the Al-Noor mosque in Christchurch. Mosque leaders confirmed Havard stayed there and studied in 2011, but denied radical teaching took place. ^ a b c Ensor, Blair; Wall, Tony; Vance, Andrea (28 July 2014). "Suspected Terrorist's Brother Rebuked". The Press. Christchurch, NZ. Nathan Jones … objected to what the speaker was telling the congregation and heckled him, Federation of Islamic Associations of New Zealand president Dr Anwar Ghani told Fairfax Media.… ‘[Jones was] told that … if you have those views [then] keep it to yourself – we don’t want to hear it here. ^ a b Dudding, Adam; Hartevelt, John (15 March 2019). "The End of Our Innocence". Stuff.co.nz. Archived from the original on 20 March 2019. Retrieved 17 March 2019. By now, 41 people were dead or dying, and a similar number had been injured.… Hundreds of mourners gathered at the Deans Avenue mosque. ^ Drury, Abdullah (2016). "Islam's History and Integration in the New Zealand Society: A Convert's View". In Kolig, Erich; Voyce, Malcolm. Muslim Integration: Pluralism and Multiculturalism in New Zealand and Australia. Lexington Books. p. 122. ISBN 978-1-4985-4354-5. ^ Kolig, Erich (2009). New Zealand’s Muslims and Multiculturalism. Brill. pp. 225, 227. ISBN 978-90-474-4070-3. ‘Fundamentalists’ and ‘Moderates’ Fighting over the Christchurch Mosque and Halal Meat… In 2003, an argument over the control of the Al-Noor mosque in Christchurch led to warnings in the popular press of alleged links to terrorism and Islamic extremism among some factions within the Muslim community. ^ Liotta, Edoardo; Borrowdale, James (15 March 2019). "Terrorism in Christchurch: One of New Zealand's 'Darkest Days'". Vice. Retrieved 15 March 2019. ^ Perry, Nick; Williams, Juliet (17 March 2019). "Mourners Pay Tribute to New Zealand Victims, Await Burials". Associated Press. Archived from the original on 17 March 2019. Wikimedia Commons has media related to Christchurch Mosque. This page was last edited on 6 April 2019, at 00:14 (UTC).